I decided to make us a a Tapas dinner for Tuesday night. This sounded tasty simple and fast. I tweaked it to make it a tad spicier. 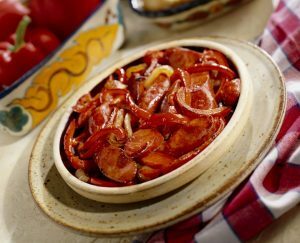 The key to this dish is getting genuine Spanish Chorizo. Mexican Chorizo is not the same. Rinse peppers; remove stems and seeds. Cut peppers into lengthwise slices, about 1/3-inch wide. Add olive oil into a heavy-bottomed frying pan and heat until oil shimmers. Fry chorizo pieces, onion and peppers, stirring often. When peppers are browned and almost cooked, add minced garlic and finish cooking.